Dedicated to unearthing and quaffing unusual, independent, and fascinating non-alcoholic beverages. Click here to send in your own Weird Soda Review! The Lab has visitors tonight. We are very lucky, in that we have made a bunch of really interesting friends (As it turns out, being a scientist/musician/historian/weird-soda-quaffing family tends to put you in contact with a variety of interesting people). One of our guests happens to be fond of a certain Weird soda which we have not yet reviewed--the Reed's family of ginger-based beverages. This friend (who shall be known as Gointotrance) was generous enough to bring some tonight, so we'll be reviewing the core of the family, the Reed's Original Ginger Brew. Reed's has a reputation for being a strong ginger soda. 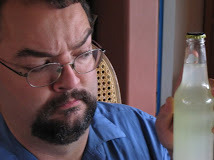 Afficionados of Reeds typically view other ginger ales (e.g. Canada Dry, Schweppes) with amused contempt. Ginger is fine with me, and I'm fond of regular ginger ales, so I'm looking forward to the experience. Color: Light brown, close--very close--to yellow. In fact, I'd call it yellow, but that's just me. Gointotrance: "Probably from the honey? Pineapple juice and honey, that's certainly going to add to the yellow color. There's also lemon and lime juices." Gointotrance: "Unlike my sodas, it's got very fine bubbles which have decided to cling to the bottom and sides. Look, the bubbles have congregated there like little see-through caviar eggs." Scent: Fairly strong ginger, kind of lemony. Not all that sweet. The sour is strong, a touch of bitter. Gointotrance: "You can smell the stickiness. Can something smell sticky? There's a kinesthetic-olfactory synaesthesia there." This blog has just become quite a bit more credible by having that terminology appear, I think. Taste: Hmm. Pretty tart, the lemon juice is prominent. The ginger has a strong but not overwhelming bite. It's sweet. There's complexity here, but I'm a little surprised that the ginger isn't stronger. Gointotrance: "Put some on your tongue and let it sit there." Ah. *pause* Yep. There's some sting. Gointotrance: "Mind you, this is not the extra-strength one." The sweetness doesn't come across in the smell, so it's a bit surprising. It's actually quite sweet, but not the corn-syrup sort--it's a more mellow sweetness. Not surprising, given the honey-pineapple sweetener. The ginger is hitting me more now. Let's try the Kibbitzer on this. K-i-C: "It's nice. It's probably the pineapple juice, but it's kind of like cider." The cider is an interesting comment. I think I see what she's saying. This is much more complex and interesting than I would have guessed. Gointotrance, having his own carbonation setup, is looking into custom soda. He has an idea for a tomato-garlic-ginger-Worcestershire sauce carbonated beverage. The mind boggles. The stomach clenches. I can't wait. This is very exciting to me--what could be Weirder than that which emerges from the depths of personal Weirdness? What Weirdness lurks in the hearts of men? The Quaffmaster will soon know! Quaff rating: 3.5. Very nice to drink, and surprisingly complex. Quite a nice surprise. Cough rating: 1.0. The ginger, while pleasant, produces some strong sensations. Aftertaste update: the ginger lingers. Gointotrance: "After you drink it, you know you've drunk it. The experience doesn't end as soon as you're done. For the next 40 minutes, you'll know you had this beverage." I've been saving this one for a special occasion. It was really cream soda which led me to become the Quaffmaster. In the days of my youth, my parents made soda choices which shaped my future development. They did permit soda in the house, although it was not in enormously plentiful supply, and so I did develop a taste for it. However, more important than its availability was its nature. At least in my youngest days, we weren't a Coke/Pepsi household. Instead, my parents opted for Shasta. Shasta stood out among the choices available to a family in Topeka for one main reason: it came in a wide variety of flavors. I clearly remember rows of multicolored Shasta cans in our refrigerator, each one a separate incipient taste experience. Only later in life did I come to realize that, for many children I knew, soda came in exactly three varieties: cola, lemon-lime, and root beer. While these are all worthy flavors, it was my days with Shasta which opened my eyes to the existence of soda...well, maybe not Weirdness, exactly, but at least relatively exotic things like strawberry, orange, and the intriguingly named "Dr. Diego". I think it came in a can which bore a tan color scheme. I don't remember the flavor clearly; it may have been of the tart, acid-laden cream soda family, or maybe a slightly mellower vanilla. Such distinctions are lost in the ever-shifting mists of memory. What I do clearly remember, though, is that cream soda was my favorite. Whenever my parents came home, bearing a variety pack of Shasta triumphantly upon their shoulders like early human hunters with a hunk of steaming mastodon carcass*, I would leap upon it and rip a can of cream soda from its cardboard viscera like a small, Lego-furred wolverine. Thus, it was in my Kansan youth that I developed my taste for soda Weirdness in general, and cream soda in particular**. I've had many a fine cream soda since then, but I've been hearing legends of this one. Those who speak of it do so in very respectful, hushed voices, as if they expected that a bottle might happen to be nearby and overhear them. It's not particularly hard to find, although it isn't usually at the regular grocery store. Thus, I'm not sure this fully qualifies as Weird. However, in the interest of exploring all facets of soda, the reputed pinnacles of excellence should not be neglected. Given that we are in the thick of the holiday season today, this seems like an auspicious occasion. So whether you celebrate Christmas, Festivus, Chanukah, or Talk Like a Pirate Solstice Day, allow me to raise a glass of cream soda wassail to you, my generous and loyal readers. Color: A fairly rich medium brown. Darker than many cream sodas. Scent: Sweet, very vanilla-y. Maybe even maple-y. The vanilla has depth and darkness; it's a sweeter version of vanilla extract. Promising. Long Rod McBean: "Smells very slightly of beer. Or maybe that's just my upper lip." I think I see what he means; the darker side of the vanilla has some complexity which is like that of a lager. K-i-C: "Eww. Does not go well with cilantro." The Kibbitzer-in-Chief has been making salsa for Christmas Eve dinner. K-i-C: "Actually, it's not unlike the Marsala." She's right. The Marsala is heady, creamy and amaretto-y, and there is something a little like that in the Virgil's. The more I smell this, the more I like it. Wyvern: "Good. But I want to change my name. I'm Nazgul now." Wow. WOW. This is outstanding. It's got a very strong vanilla, with the depth of real vanilla, but without most of the bitterness. Behind that, it's got some of the lighter french vanilla found in most of the cream sodas. It's a lovely balance, holding the main options in vanilla in concordant opposition***. The aftertaste continues the balance, although the french vanilla does turn slightly more acid, taking a bigger role in the balance. The balance and complexity are remarkable. LRMB: "I wouldn't say it's the heartiest cream soda I've ever had. I'd call it a light cream soda. Maybe...a cream soda to go with a fruit tray and some cheese, rather than a hearty stew. You might want a darker, heavier cream soda on a cold day. Might be good with Mexican food with a squeeze of lime." The rest of us gaze open-mouthed at Long Rod McBean's unsuspected culinary depths. K-i-C: "That's not very relevant." LAT: "Yeah, but they are!" K-i-C: "Yes, but would they like this cream soda?" LRMB: "This cream soda would go well with prosciutto. Or else grapes, green grapes." The funny thing is, he's right. This soda has enough character that it would go better with some foods. What a lovely holiday treat. Bravo! Quaff rating: 4.5. Among the most enjoyable sodas I've had. Cough rating: 0. I can't think of any reason I'd be unhappy with this. * Note: This was NOT one of the available Shasta flavors. I think Jones may be working on it, though. ** Plus, I still have a fondness for certain cardboard varietals. *** Which is, if I remember, the outer alignment plane of true neutrals in 2nd edition AD&D. Each review will include where and when the soda was purchased, and a description of the scent, color, and taste. Each soda will be rated on two scales; the Quaff rating reflects the enjoyability of the drinking experience, whereas the Cough rating indicates how likely one would be to throw it up after "enjoying" it (believe me, some sodas might rank high on both scales). Both scales are points out of 5. Hover your mouse (place it there and leave it for a couple of seconds) over each rating to see a more thorough explanation. In addition, the overall Weird Soda Review Index is determined by subtracting the Cough Rating from the Quaff Rating. It can thus vary between +5 and -5. We're very scientific people, here at the Lab! Meet the Weird Soda Review staff! Have you tried a soda recently which changed your life? Did you find a bit of bubbly stuff which produced a state or transcendence or terror? Share it with the world! At the bottom of this page, there is a form to submit your very own Weird Soda Review. Fill it out and hit "Submit", and we here at the Weird Soda Review will put it up for all the world to see. Questions, comments, or suggestions? Email us at quaffmaster@weirdsodareview.com. Subscribe To Weird Soda Review! The Really Weird Beverage Co. Send In Your Guest Review! I will post reviews as submitted, with editing only for length (if unreasonable) and content (I don't want this to be an adults-only blog). Legal stuff: This blog is covered under a Creative Commons 3.0 Attribution-Share Alike (BY-SA) license, which basically means that you can use material from the blog (including for commercial purposes) as long as attribution is given, and that you can create derivative works as long as those works are covered undersimilar licensing terms. When you submit a review, you are granting me an irrevocable license to print your review with minor modifications as described above, and agreeing that your work will be posted under the same licensing terms. You are not giving up your ownership of your writings, and may distribute or publish them elsewhere as you wish. Should this blog ever get ads (Heaven forfend! ), you don't get any of the money from them. NOTE: I will never divulge, sell, publish, or do anything with your email address other than contact you if your review needs to be substantially altered, or if there are any concerns about it. You don't have to provide it, but if you don't and I need to contact you, I just won't post the review. This work by http://www.weirdsodareview.com is licensed under a Creative Commons Attribution-Share Alike 3.0 United States License.